Our separating walls are double brick firewalls right up to the roof with a clearance at the top approx. 5 cms to allow for air circulation throughout the block. Metal roof 0.8 mm, chromadecked both sides which keeps the unit cool and provides double protection against leaks. We guarantee “no roof leaks”. The fourth side of the unit is a roller shutter door for which the tenant provides his own padlock and keeps all the keys, we have no access to the unit. The white chromadeck roofs reflects 95% of the sun and heat. WE MADE A DECISION AT THE START OF OUR PROJECT TO USE A CHROMADECK (EPOXY PAINTED) WHITE ROOF AND NOT GALVANISED STEEL WHICH PROTECTS OUR CUSTOMERS GOODS, GALVANISED ROOFS CREATE ENORMOUS HEAT BUILD-UP WHICH DAMAGES GOODS INSIDE THE UNIT. 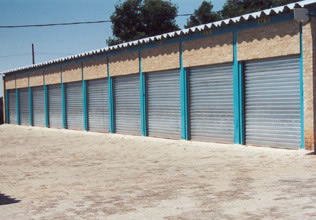 We have more than 1000 units on site. You have access to our premises 24 hours a day, 365 days of the year. After hours all our phone numbers are diverted to our cell phones,in the event our customers are in need of our services. We are on duty 24 hours for our customers. All units are sprayed against white ants, when Vacated, before the new tenant moves in. Leases are month to month on a calendar month basis. With no extra cost or appointments made. We require a deposit equals to 1 Months Rental which will be refunded one month after the end of the month in which you vacate the unit providing the unit Is clean, there is no damage and no arrears of rent. You will be required to give notice in writing to the office no later than the 15th of the month In which you wish to vacate the unit. However, should you require the unit beyond the notice date please advise us and you remain in the unit and will be required to pay the next months rental.